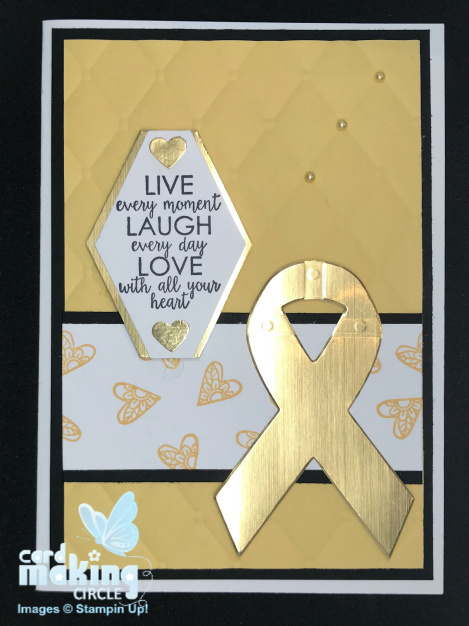 Have you struggled to find right card for a loved one or friend who has Cancer? Traditional "Get Well cards" don't seem to send the right message especially if they're about to start months of treatment. What's needed is a card that offers hope and encouragement to sustain them through the dark days. A card to let them know that you're there for them with a positive message. It's a long journey from Cancer diagnosis, to treatment, to surgery and being in remission. Your simple act of sending a card(s) creates a reminder that they're valued and not alone on this difficult journey. 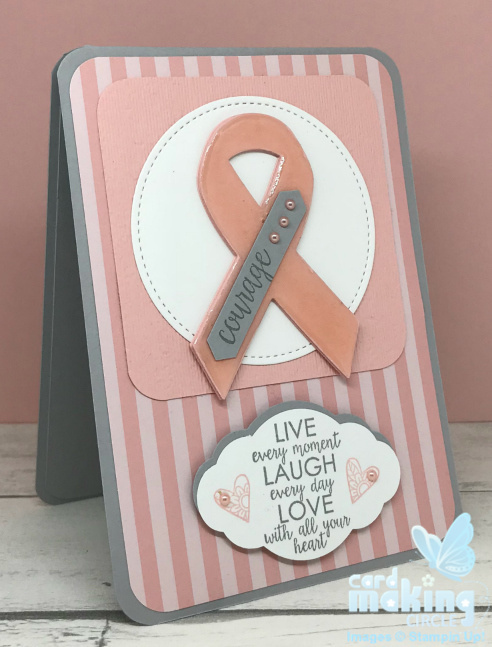 The majority of the cancer cards are based around the Awareness Ribbon - an international symbol that is used to increase awareness of different medical conditions and disabilities. Different colours and patterns represent different causes. 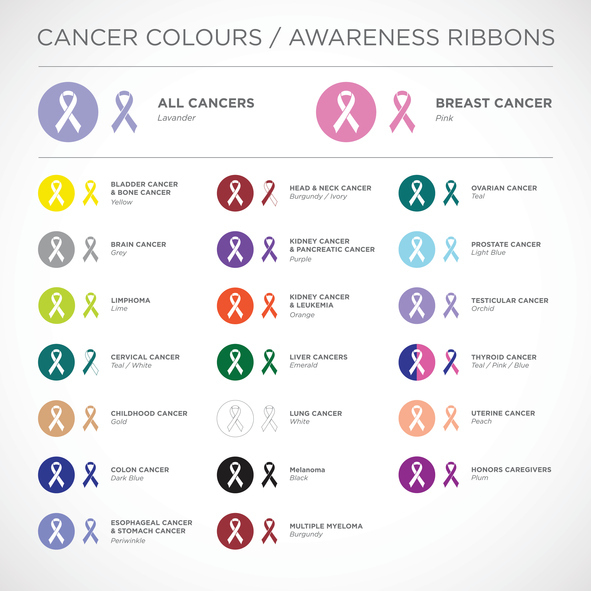 Most people recognise that a pink ribbon represents Breast Cancer...but did you know that each of the different Cancers have their own individual colour? 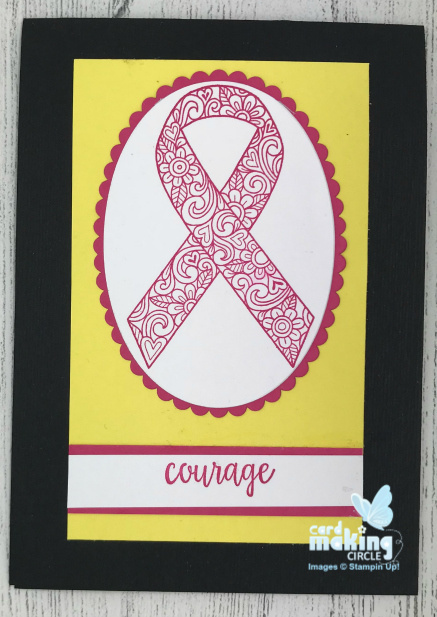 To create these cards I used the "Ribbon of Courage" stamp set from Stampin Up! A clean and simple card to represent all cancers. Die cut an oval into layer one. Glue layer one onto the card base. Stamp the ribbon of courage and sentiment into the white centre of the oval. Die cut the flower and leaves from silver card. Glue to the front of the card and complete with a glass embellishment. 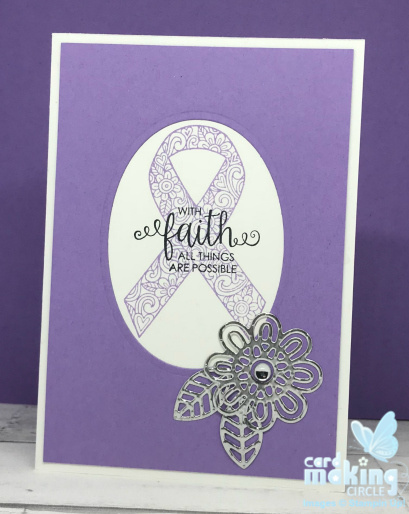 Card two uses three layers - the card base, layer two in plain lavender and layer three, white card stamped with the Buffalo Check background stamp. 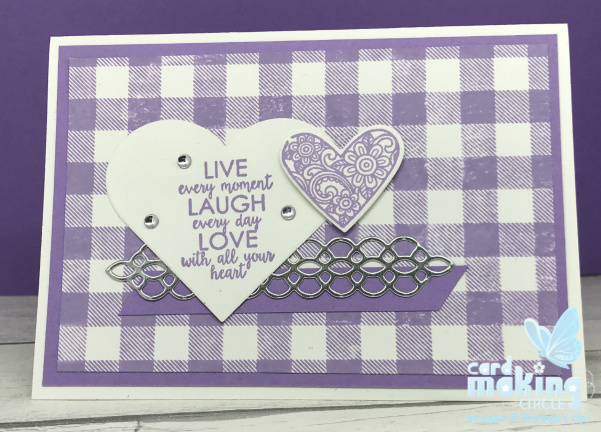 Die cut an intricate strip with silver card (optional) and add to layer three with a strip of lavender chamfered at both ends. Stamp the sentiment and heart onto Whisper white card. Die cut or fussy cut both hearts and mount onto layer three with foam pads. Add three glass embellishments to complete the card. This card uses a craft coloured card base. Layer one is cut from a sheet of designer wood grain paper. Cut co-ordinating light blue patterned paper into strips and glue to layer one. Stamp sentiment onto layer one. 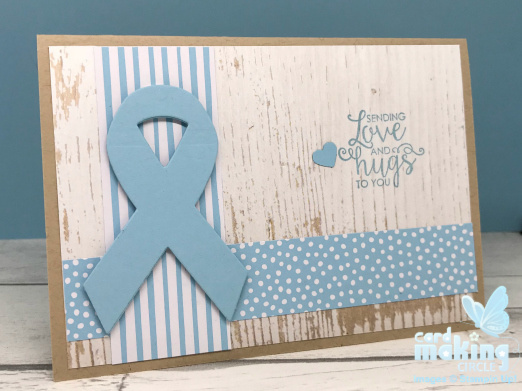 Die cut the awareness ribbon in matching blue card. Mount onto front of card with foam pads. Add a small punched heart as the final embellishment. 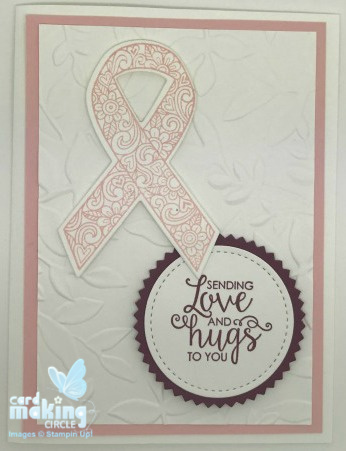 This card was created for friend who was recently diagnosed with Breast Cancer. I choose to complement the pink with grey to create a soft and feminine card. Round corners of the card base, layer one and square pink layer with a corner punch. Die cut a stitched circle from white card and glue to the pink square. Attach both to layer one and the card base. 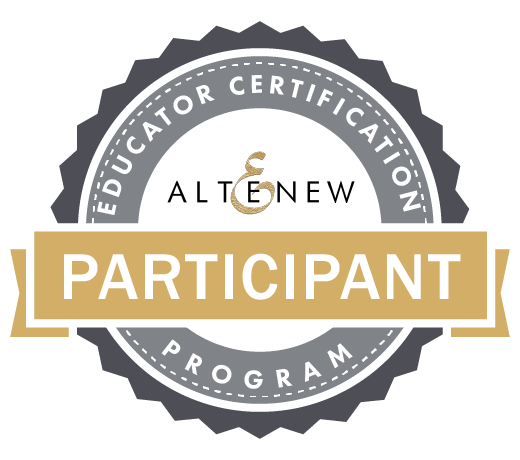 Die cut the awareness ribbon four times and glue together to create a solid ribbon. To create the gloss on the ribbon (optional) cover with Glossy Accents and allow to dry overnight. (With hindsight I would have left this plain as it changed the colour of the ribbon!). When dry add the courage sentiment strip with pink pearls to the ribbon. Attach to white circle. Stamp the main sentiment onto white card and punch out with the Pretty Label punch from Stampin Up! Punch a piece of grey card to add behind the sentiment as a shadow. Add a few stamped hearts and pearls to complete the card.